A contemporary of the second generation painters of the Hudson River School, George Inness evolved from an aesthetic close to the American landscape painters to a more personal style influenced by his knowledge of the latest European painting trends of the Barbizon School, which earned him renown as a painter in his last years. Inness began training in Newark under the supervision of the travelling painter John Jesse Barker and in 1841 went to live in New York, where he studied under the French painter Régis François Gignoux, a former student of Paul Delaroche. In the mid-1840s he began to exhibit his work; first at the National Academy of Design in 1844 and the following year at the American Art-Union. He made his first trip to Italy from 1851 to 1852. He returned to the Old Continent in 1853 and visited France and Holland. On this second trip he viewed the work of the landscape artist Claude Lorrain and that of his own contemporaries of the Barbizon School, and his style became heavily influenced by these French painters, especially Théodore Rousseau. Thenceforward his compositions became less rigid and gradually shifted away from the canons embraced by the Hudson River School, adopting a much less literary approach to the American landscape. George Inness’s frail health largely determined his life and led him to move from New York to Medfield in 1860 and in 1864 to Eagleswood, where he was introduced by the painter William Page to the mystic teachings of the Swedish philosopher Emanuel Swedenborg and became a follower of this current of religious thought. Thereafter his art tended towards greater expressiveness and mysticism. 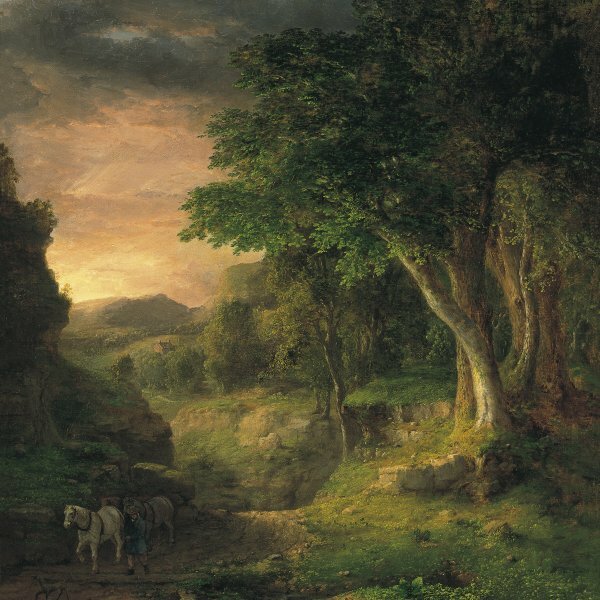 Inness travelled again to Italy in 1870, by which time he was a fully-fledged member of the National Academy of Design and had been involved in establishing the Society of American Artists. After spending four years there followed by a brief period in France, he returned to America. He settled in a farm in Montclair, New Jersey, which he only abandoned for shorts spells at the Niagara Falls, in Virginia and in California. He died during a trip to Scotland in 1894.